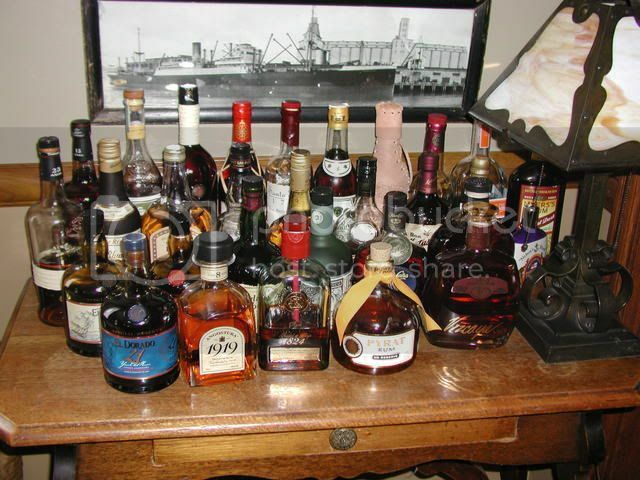 There's about 90 rums on this counter at any one time, another 120 or more in the cabinets and at least 50 or 60 stacked in boxes, behind doors, next to the refrigerator, in the trunk of my car -- or any other place I can find to keep them without getting yelled at by my wife. Last edited by RobertBurr; 03-02-2008 at 07:22 PM. That's looking like my boat, except the labels are fresher. I was boarded by customs in Martinique a few years ago and they discovered 87 bottles of rum before they gave up. Since I didn't have any receipts and stuck by my story that this was for research purposes only and I wasn't selling anything they appeared to be a little confused. Language was an apparent problem, as is often the case in foreign countries. One of the men refused to admit he spoke any English until I showed him a picture from a magazine of the boat and me. Then things loosened up. Over the next few weeks I'd see these customs men at a bar after work and share a ti punch and a few sips of rums they weren't able to taste on Martinique. Fortunately, they were looking for other contraband and a few cases of rum for personal consumption on board a boat are technically legal, if you've checked and declared Ships Stores in Ballast. Great collection! I see that I have a long way to go. I need to get a new picture of my collection. The current picture on my site is about 8 months old or so, and therefor missing about 20 bottles. My collection has outgrown the shelf I originally dedicated to it. This is the last picture I have of it. You are the MAN Robert! Wow. I bow to you all. I thought I was doing pretty well with seven bottles! You're going to need a bigger table. Those are all wonderful products. Anyone else going to post a photo?